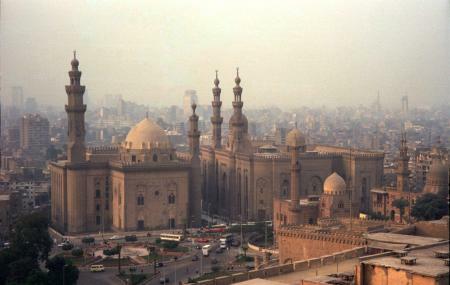 Al Rifai is not an ordinary mosque in Cairo. It holds great historic significance. The mosque was resting place of the last Shah of Iran. Mohammed Reza Shah Pahlavi, who lost his life in 1980, was buried at this mosque. The last monarch of Egypt King Farouk and many other Egyptian royals were also buried at the Al Rifai Mosque. The mosque is quite a peaceful place and the architecture and interiors are commendable. How popular is Al Rifai Mosque? People normally club together Coptic Church Of St George and Festival City Mall while planning their visit to Al Rifai Mosque. huge historical mosque, built by the mother of an Egyptian gouverner, very well decorated from inside and outside, the engineers did their best for more than 20 years to finish this big architecture and to look as big as it's neighbour historical unique mosque of sultan hassan. Mohammad Reza Shah Pahlavi Iran's king . After the October 1978 rebellion,Mohammad Reza died from complications of Waldenström's macroglobulinemia on 27 July 1980, aged 60. Egyptian President Sadat gave the Shah a state funeral. In addition to members of the Pahlavi family, Anwar Sadat, Richard Nixon and Constantine II of Greece attended the funeral ceremony in Cairo. Mohammad Reza is buried in the Al Rifa'i Mosque in Cairo, a mosque of great symbolic importance. Also buried there is Farouk of Egypt, Mohammad Reza's former brother-in-law. The tombs lie to the left of the entrance. Years earlier, his father and predecessor, Reza Shah had also initially been buried at the Al Rifa'i Mosque. One of the oldest mosques in Cairo. Beautiful architectural beauty of this place will touch your soul for sure.